The very specific flavor of the sauce is created by dark roasted red pepper, the ruby-red Aleppo pepper (or Pul biber as its called in Turkey) and pomegranate syrup. In a traditional muhammara you also add breadcrumbs or couscous. In my version I have chosen to add boiled and cooled off millet. Millet is a grain, free from gluten and reminding very much of couscous in its looks and natural taste. The result is a rich sauce with so many flavors! The sweetness from the grilled peppers, the sourness from the pomegranate syrup and the spicy touch from the aleppo pepper flakes. The millet and walnuts gives a bit of a bite and breadth to it. Enjoy your muhammara with bread, vegetables and beans, on pizza or as today with oven baked sweet potatoes. The ready muhammara should be stored in an airtight container with a lid on in the refrigerator. It lasts about 4-5 days. For dinner I also added fresh pomegranate kernels, chopped cilantro (can also be replaced with leaf parsley if you prefer) and super simple black-eyed beans. I just fried them in a frying pan with some coconut oil until they started cracking and then added smoked pepper powder and dried thyme. So simple and so good together! Sweet potatoes are really easy to bake in the oven, the problem is that it always takes longer than you think. An hour for sure! A faster option is to bake it in the microwave; Wash the potato and punch some holes in the skin al around it with a fork. Place a piece of kitchen paper on a plate and place the potato on top. Count four minutes per 100 grams at 800 W. Turn the potato occasionally with a tweezers or similar to avoid burning your hands. Finally, try so that it is soft al through. Wrap the ready potato into foil and leave it for a few minutes. 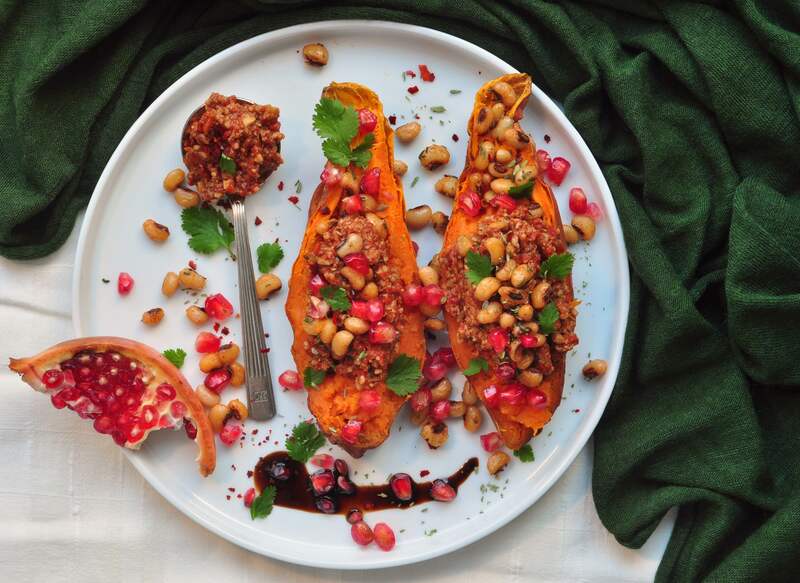 Cut the potato open and garnish with muhammara, beans, pomegranate and chopped cilantro. Dinner is served! Place the whole red bell peppers on a baking sheet covered with baking parchment. No need to add oil at this moment. Bake the red peppers in the oven for about 40 minutes. Turn them over every now and then to get them evenly roasted. When they have black blisters and wrinkled skin al over, place them steaming hot in a plastic bag and close it for a few minutes. This way the peppers are easier to peel and don’t forget to discard the seeds and membranes as well! Let the peppers lose some of their juices before you get started with making the Muhammara. If you want to make it easy for yourself, you can also buy grilled and peeled peppers in the supermarket. 2. Boil the millet in a small saucepan as instructed on the package. They should still have a bite when ready. 3. Add the sliced bell ​​peppers, lemon juice, pomegranate syrup and a small clove of garlic to a high mixer bowl. Mix it with a hand blender or use a mortar for a slightly coarser texture. 4. Add the other ingredients and stir with a flat spatula to get everything well mixed. Season with salt and aleppo pepper flakes. If you are unsure of the heat from the aleppo pepper, try a smaller amount of pepper first and taste in between before adding more. Serve your wonderful muhammara as mentioned in the post. This recipe is free from gluten and lactose.